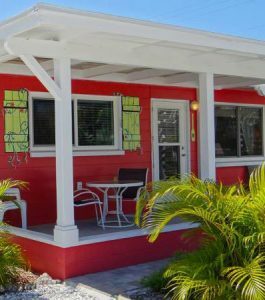 After visiting scenic beaches and partaking in outdoor sports like fishing, boating, hiking and more during an Anna Maria Island vacation, you’ll need to rejuvenate as the sun starts to set. Thankfully there are a number of enticing happy hour options to choose from nearby depending on your cuisine preferences and location. Happy hour times frequently change for these local restaurants, so we’ve provided you with phone numbers of each establishment so that you can call ahead of time to confirm their specific happy hour schedule. Beach House Restaurant – One of the top happy hours on the island, you can find some excellent deals on a range of appetizers here and enjoy them while overlooking the ocean including oysters, shrimp, clams, fish fingers, bruschetta, mixed drinks and more. The happy hour only goes from 2 to 4 p.m. and fills up fast so arrive early, and it is located at 200 Gulf Drive North in Bradenton Beach. Call for reservations at (941) 779-2222. Bridge Tender Inn – Located on historic Bridge Street, the Bridge Tender Inn offers a nice selection of pub grub dishes and some nicely prepared dinner entrees that creatively incorporate fresh local seafood. Drink discounts and other specials are available from 4 to 7 p.m. during their happy hour. Visit them at 135 Bridge St, Bradenton Beach and call ahead at (941) 778-4849 for more details on their happy hour specials. Island Time Bar and Grill – Offering happy hour specials throughout the day on quality appetizers and drinks during the weekends, this restaurant is known for its quality locally sourced seafood dishes at reasonable prices with frequent live music. Visit them at 111 Gulf Dr S, Bradenton Beach or call ahead at (941) 782-1122. Hurricane Hanks – Offering incredible drink specials along with delicious pub grub, you can’t go wrong with Hurricane Hanks in Holmes Beach. Call for specifics on the specials at (941) 778-5788 or drop in at 5346 Gulf Dr., Holmes Beach. DCoy Ducks Bar & Grille – A popular hangout for locals and young people, you’ll find a great selection of 2 for 1 drinks specials during the happy hour on Fridays and Saturdays from 6 to 9 p.m. Located at 5410 Marina Dr. in Holmes Beach, call at (941) 778-5888. Waterfront Restaurant – Happy hour specials are available each day from 4:30 to 6:30 p.m. at this unique restaurant that faces the ocean and Sunshine Skyway bridge. Stop here after visiting the nearby City Pier and enjoy great prices on seafood, appetizers and over 30 beers and micro brews. Call ahead at (941) 778-1515 or visit a 111 South Bay Boulevard, Anna Maria. The Sandbar Restaurant – As one of the area’s longest running and most popular establishments, the Sandbar Restaurant is always an excellent place to enjoy a happy hour meal or dinner with some of the best water views on the island. You can make reservations and get more specifics on happy hour specials by calling ahead at (941)-778-0444. Located at 100 Spring Ave, Anna Maria.